In the dark fiery pits of hell there was torture and pain everywhere. The screams of the damned souls resounded through every corner of this endless... hell. Normally demons enjoyed all this a lot. 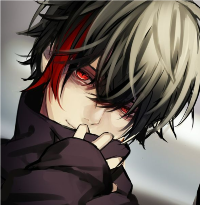 Just one particular demon was plain bored and decided that he wanted to play a little in the human world again. This was not a problem as long as he would make some humans sin and preferably have them sell their soul. Hell just had loose rules like that. It had been ages since he had last been in the human world. Just before he left hell, he took on his human appearance. Deceiving is so much fun. He also took on a human name, and then he stepped out of an alley in a busy city. It was a typical place where one human more or less wouldn't attract any attention. Or a demon with human appearance if you take it very accurately. It was also a perfect place to have some fun. Shigure smiled as he stepped into the streets and quickly disappeared into the masses.